Product DescriptionThe new Caboose Graphite is a must-have for parents strolling with children of different ages because it offers double stroller features in a compact size. With a new lean profile and upgraded features, the Caboose continues to empower older siblings. Toddlers get a boost of independence and feel like big kids when they can choose to sit or stand, face forward or backward, while riding on this tandem stroller. No need to attach an extra riding board as the Caboose has a built-in stand-on platform for kids to stand and ride or they can sit on the rear bench seat (parents don’t need to lift their toddlers in or out of the stroller either). Parents expecting their second child love that they can create a travel system to carry their toddler and newborn. The Caboose Graphite comes with a universal car seat adapter that has baby facing towards you and in complete view while strolling. Having both children close can be a lifesaver to help parents keep tabs on both kids. If your children are within 2 years of each other, you may consider the optional Caboose Rear Seat, which converts the rear bench seat into a front-facing, full-size, reclining seat. 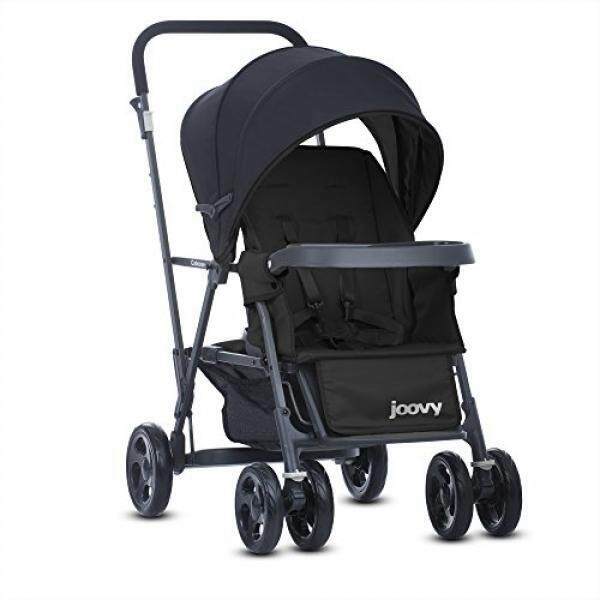 This accessory is sold separately and it folds up with the stroller for convenience. It’s also easy to install or uninstall. The new Caboose Graphite includes the following upgrades from the previous version: A graphite-colored steel frame, a new 3-position front seat, a larger canopy with an extended visor, linked parking brake and 4-wheel suspension. Additionally, the Caboose comes with a tray and universal car seat adapter that fits most major brands. Each seat has a capacity of 45 lbs.